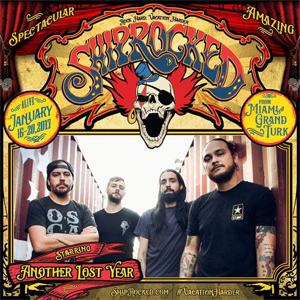 ANOTHER LOST YEAR has announced they will be joining ShipRocked, set for January 16-20, 2017 onboard Carnival Victory. They will join headliner BREAKING BENJAMIN along with PAPA ROACH, ALTER BRIDGE, SEVENDUST, POP EVIL, THE STOWAWAYS all-star band and more on The Ultimate Rock ‘N’ Roll Cruise as it sails from Miami, FL to Grand Turk in the Turks & Caicos Islands. The band will also be playing Laconia Fest, the Motorcycle Music Festival, which will take place June 11th-19th, 2016 in Laconia, NH. Additional dates have been added to the band’s summer schedule in support of their release Alien Architect due out on June 10th via EMP Label Group & Mirage M'hal Records. Their latest video for “Wolves” can be seen on KNAC.COM right HERE. 5/12/2016 - Chesterfield MI @ Diesel w/ P.O.D. 5/18/2016 - Belvidere IL @ Apollo Theatre w/ P.O.D.